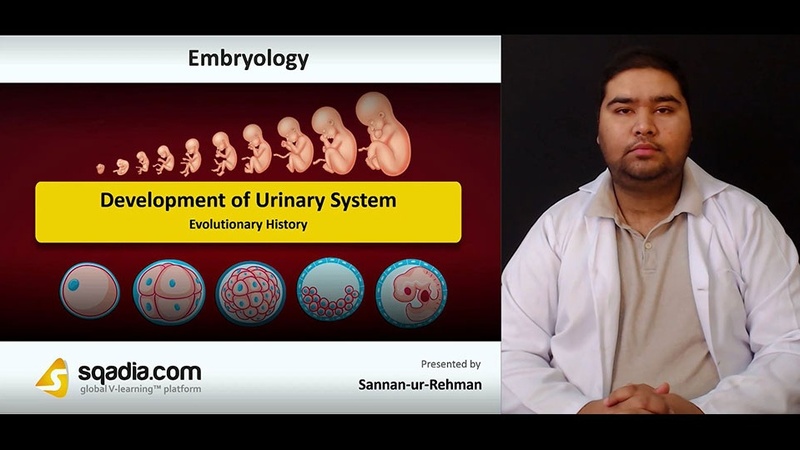 This lecture delivers extensive information about the topic Development of Urinary System. Section one primarily focuses on the Evolutionary History of Urinary System. It Develops from intermediate mesoderm and primitive cloaca. Firstly, the Intermediate Mesoderm is explained in depth with the help of diagram. The educator then demonstrates Cloaca after which light is shed on Evolutionary Stages of Kidney. Then educator concludes this section with the explanation of Sequence of Events. Section two is dedicated to the discussion of Kidney. The educator talks in detail about Development of Permanent Kidneys and Ureter. And then the Development of Collecting System. Subsequently, a comprehensive explanation of Stages of Development of Nephron takes place. Later, the educator pursues the topic of Ascent of Kidney. Furthermore, Arterial Supply of the Kidney is discussed in detail. At the end of this section, the educator highlights Rotation of the Kidneys. Section three is about the Clinical Correlates of Kidney. An overview of Renal Agenesis is presented after which the concept of Unilateral Renal Agenesis is clarified. The educator then demonstrates the Bilateral Renal Agenesis. Then educator explains in detail the Duplication or Multiplication of Kidneys. Subsequently, the educator reports Congenital Polycystic Kidney. Then educator explains in detail the Horseshoe-Shaped Kidney. Concepts of Lobulated kidney, Pelvic Kidney and Pancake Kidney are then explained in detail. Educator then concluded this section with the explanation of Supernumerary/Aberrant Renal Arteries. Section four deals with the explanation of Ureter. The educator comprehensively explains Development of Ureter. Afterwards, the concept of Congenital Anomalies of Ureter and Double Renal Pelvis is clarified. Later, the educator explains the Bifid Ureter, then Double Ureters, Ectopic Ureter and Postcaval Ureter are discussed. At the end of the section educator gave a brief summery of Ureter and its concepts. Section five imparts detailed information about Urinary Bladder and Urethra. First of all, the Development of Urinary Bladder is discussed in detail including its aspects. The educator then focuses on Development of Trigone of Urinary Bladder and Development of Coats of Bladder Wall. Afterwards, the Urachal Sinus is extensively elucidated followed by a description of Urachal Fistula and Urachal Cyst. Subsequently, light is shed on Exstrophy of Bladder (Ectopia Vesicae) and Development of Urethra. At the end of this section, the educator talks in detail about Development of Male and Female Urethra.